Transport bosses in the Sheffield city region (SCR) have revealed that the cost of renewing the existing Supertram network will be around £230m, and some local councils don't want that cost passed on to them. Rothbiz reported earlier this month that the SCR was developing proposals for a Mass Transit system, identifying a potential network of "key movement corridors" to support growth. At the same time however, it is having to deal with the issue of the existing Supertram network which will require re-railing, new signalling, communications and power supply as well as replacement trams. Consultation has now begun in connection to developing the business case that will be submitted to the Department for Transport to support the funding of any renewal works. As part of this business case all possible options need to be explored, and consulted on and then a preferred option for the system needs to be submitted. Options include spending £230m carrying out essential work on the Supertram system when needed, spending a similar amount modernising the system from 2024 with new assests, or decommissioning the tram system replacing it with a dedicated, high quality, bus network from 2024. 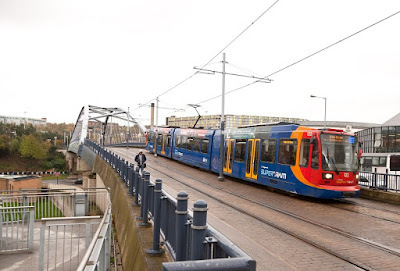 Dan Jarvis, mayor of the Barnsley, Doncaster, Rotherham and Sheffield Combined Authority, said: "For more than 20 years the Supertram has been a fixture within Sheffield and the region and has been making more than 12 million passenger journeys a year. "We are now working with South Yorkshire Passenger Transport Executive (SYPTE) to establish what the future of the Supertram system might look like. We want to hear from those people who currently use the Supertram, and those who don't, about what its future should be. I would encourage as many people as possible to have their say." A funding bid is due for completion and submission to Government in the first half of 2019 but 20% of the costs of the scheme will need to come from the city region. At a recent meeting of the combined authority, Ros Jones, mayor of Doncaster welcomed the mass transit concept "but asserted the cost of Supertram renewal must be met through grants and fares, and not passed on to the local authorities." Cllr. Sir Steve Houghton CBE, leader of Barnsley Council, has previously raised concerns over the renewal costs for the Supertram network. Sheffield Council, whose transport strategy states that Supertram renewal is its "most pressing challenge," has started work on a potential workplace levy, which has been introduced in Nottingham to fund their new tramways, and other transport initiatives. Opened in 1994, Sheffield's Supertram system cost a reported £240m and now serves major residential and employment sites in Sheffield. A delayed tram-train pilot project is set to bring new vehicles to Rotherham in 2018. Stagecoach's operating contract runs until 2024. Stagecoach assumed responsibility for the operation and maintenance of the network. Ownership of the asset remains with SYPTE. In 2014 an unusual accountancy procedure was carried out by the city region to deal with a deficit of £30.5m on its general reserve budget with a significant part of this relating to capital expenditure incurred by the SYPTE as part of the construction of the Sheffield tram network. A major programme of rail replacement works on the network is currently taking place at an estimated capital cost of £32m. Thank heaven we in Whiston, Listerdale, Wickersley, Bramley and Hellaby stopped this disgraceful shambles of a waste of public money. Had we not, who knows what top-up of the begging bowl they would be calling for. Trams had there day years ago at a time when councils are cutting back and removing services their is no way one more single penny should be spent on this thing . Close the service and use a bus instead job done.